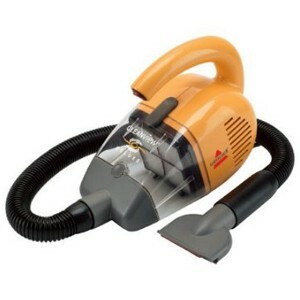 For the past 12 years, I’ve been using this Oreck Compact Canister Handheld Vacuum. It’s not at all like today’s modern hand vacs. It’s kinda clunky, slightly noisy, and has bags that need to be changed all the time. We mostly have hardwood floors in our 2-story house. Downstairs, there’s only one room that has any carpet at all. Upstairs, the stairs and the landing are hardwood, while all 4 of the rooms are carpeted. The point: We don’t have much carpet to vacuum these days. And since we rarely even go upstairs, I only vacuum up there whenever we’re expecting visitors. That’s why a handheld vacuum makes so much sense in our home — especially since we have a dog! A hand vac makes it so quick and easy to get rid of dust bunnies, dog fur, and food crumbs — as needed. A quick swipe along the baseboards, corners, window ledges, and the hardwood stairs makes it easy to have a clean looking home in just a matter of minutes. I definitely couldn’t live without a handheld vacuum. I thought I needed a better one. A: Cordless (or have a very long cord) …so I can pick up the pet hair that gathers in the corners of each step of the stairway. B: Narrow-ended crevice tool …so I can get rid of pet hair in tight corners. C: Soft-tip brush tool and an extension tube or hose …so I don’t have to bend real low while removing the dust form baseboards along the floors. 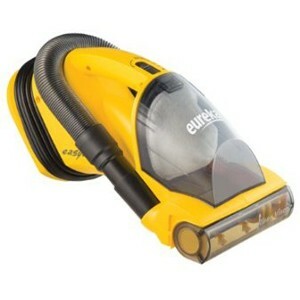 D: Powerful motor …so it will pick up pet fur, dust, and crumbs in one swipe (rather than having to make several passes). E: Bagless canister, eliminating the need to buy bags all the time …so it needs to have a filter that’s easy to clean. F: Long life per use …so it needs a battery that holds its charge a long time, eliminating the need to be recharged after 5 minutes; or it needs to have a long cord. G: Lightweight shell …so it’s easy to tote around without getting achy arms or back. H: Affordable price …so I won’t have buyer’s remorse as soon as I get it home. I decided to use this list of features as a way to narrow down my choices and find the best hand vacs for someone with hardwood floors and a dog that sheds a lot. Based on the above features, following are the best hand vacs — starting with the best. Trust me, I explored many other hand vacs, in addition to these 4 — at great length. In the end, for someone with hardwood floors and a shedding dog, it’s clear that these are the 4 best hand vacs based on the above features. So, Which One Did I Buy? I discovered that I still have a number of replacement bags left for the Oreck caniseter vacuum that I already have, so I’ve decided to use those up before buying a new handheld vacuum. In the meantime, I’m watching for the Bissell CleanView Deluxe Corded Hand Vac to go on sale in stores. If I see one at the right price, it’s mine! It’s super powerful. The suction power is top-notch. That will be hard to match (or exceed) in a battery-charged hand vac, since they naturally lose power and suction as you use it. It’s got a really long (30-foot) cord — which is great for vacuuming more than one room at a time, including stairs. It’s easy to go from room to room, rather than having to stop and plug it in every time I change rooms. And I definitely like that I don’t have to keep charging a battery all the time. It’s quick and handy to use. I keep it in the closet where we keep all our cleaning supplies. It doesn’t matter that it’s big & clunky. No one sees it. While it’s not as lightweight as I’d like it to be, thanks to the over-the-shoulder strap that’s attached, it’s fairly easy to lug around — kind of like a chunky purse. As a result, it seems more lightweight than it is and it’s easy to tote from room to room without my arms and back getting achy. They help to reduce the amount fur that ends up in the corners of your rooms (and the tumbleweeds that roll across your hardwood floors) by making it simple to vacuum most of the loose fur directly from your dog’s coat. Some dogs are terrified of the noise and the suction on their skin. Others quickly adapt to it. And yet others crave the one-on-one attention and actually enjoy getting brushed with the vacuum attachment!